Leupold 59100 Mark 4 1.5-5x20mm MR/T (One-Inch) Tactical Riflescope FREE SHIPPING! The Leupold Mark 4 1.5-5x20mm MR/T (One-Inch) Tactical Riflescope is a premium quality compact scope designed for accurate medium range shooting. It features the exclusive Special Purpose Reticle, which includes multiple methods of distance estimation for improved rangefinding capabilities. The precise click windage and elevation controls allow you to easily compensate for distance and crosswinds, making difficult shots routine. The scope also features an Xtended Twilight Lens System, which uses advanced multi-layer coatings on each optical surface to provide maximum light transmission, particularly in low light conditions. The precision-engineered lenses provide a clear, high-contrast image, and the external surfaces are coated with scratch-resistant DiamondCoat 2. The rugged aluminum tube contains a proprietary blend of argon and krypton gas for total waterproof integrity, and comes with flip-back lens protectors for enhanced protection. 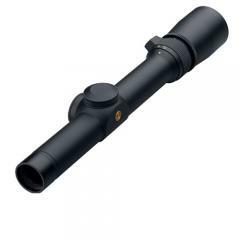 ©2002-2019 CopsPlus.com: Leupold 59100 Mark 4 1.5-5x20mm MR/T (One-Inch) Tactical Riflescope FREE SHIPPING!